Local Jobs stands by a simple statement - local jobs, national coverage - yet it is backed up by a solid platform. For the past years, they have evolved from a startup company with great ambitions on the local market to a complex responsive platform. Companies need them to find the right candidates and regular people use them to easily search for their dream jobs. It was their hard work and commitment that did all that, but we also had our contribution. When they approached us, they put everything on the table from the very begging. So we knew exactly from where we were starting, where we were heading and… what we were getting ourselves into. We loved every single step of this project! Complexity was the key word. They were aiming for a massive website, where users would create accounts and handle lots of information; therefore, a well-thought user interface was essential. That’s how we decided to begin our project by planning a solid wireframe. Only after we were satisfied with how the users were supposed to navigate throughout the website and the way our features would have worked, we moved on to the planning and the implementation of the actual design. The client wanted it clean and simple, but we thought a touch of seriousness along the way will also be more than welcomed. So we emphasized professionalism through a neat and tidy font, juggling with font sizes and spacing. Everything had to constantly remind visitors that they’re on a reputable platform for creating jobs, building careers, and shaping futures. We researched competition in the field and fleshed out the client’s strongest features. At the same time, we identified his potential flaws and the strategies to minimize them. We didn’t sugarcoat anything, presenting both sides of the coin, convincing and helping the client to improve his product. It all had to be super user-friendly, since part of their targeted audience has never used such a service before. Imagine a platform with hundreds of pages and content spread through all of its corners. Keeping consistency in design is never easy, let alone when the website is extended to such a level. Nevertheless, our team managed to overcome the barriers and provide just the kind of design that the client asked for - simple and professional, suggesting unity and contributing to the brand’s reputation. Sure, we wanted to create a simple platform that displays just the right amount of information. 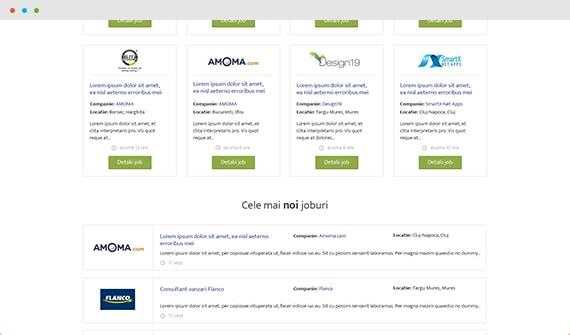 But when designing a platform for job searches, you end up displaying up to 15-20 company brands at the same time. Needless to say, it’s a lot of information, color and distraction from the actual content. Our solution was to keep logos to a minimum and emphasize instead the jobs’ names and descriptions, thus enhancing the user experience. Unfairly ignored by many designers, typography is one of those choices that make website visitors subconsciously gauge and judge the entire platform by. We knew from the very beginning that building a website based almost entirely on text information will pose challenges in terms of design. Yet choosing the right font for all that text proved to be even harder. Eventually, we opted for Ek-Mukta and its amazing readability even in small sizes. The user interface needed to be very welcoming, but at the same time a bit authoritative. We couldn’t allow our user to do any guess work, so we displayed most of the information on a white background for an easy reading. In addition, we designed the most important features and buttons in green or blue, for a more significant visual contrast. 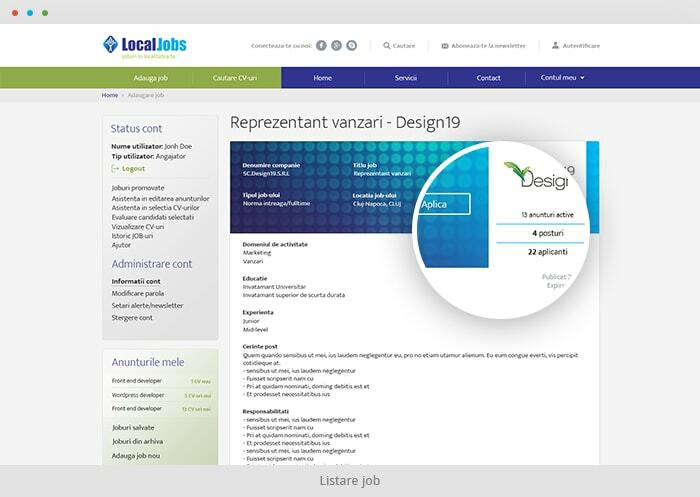 Explore this slide on the right side for a better view of what visitors experience on the Local Jobs website. 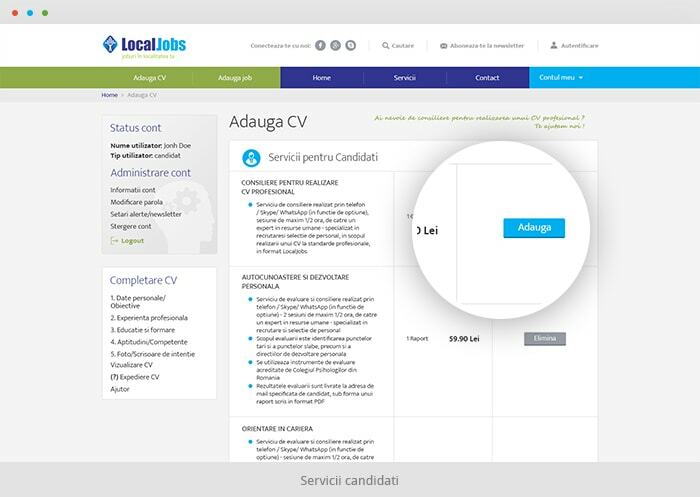 Most job-search platforms rely on a standard form where users select the location of the desired job, among some other options. While we implemented this pattern, to keep things familiar for those who have previously used such platforms, we also added an interactive map. This map displays all the counties in the country and doesn’t just add a strong visual impact. 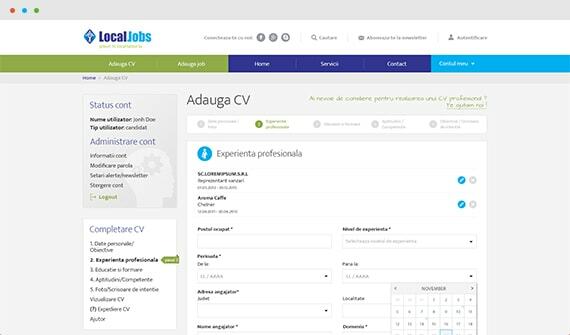 It also makes room for a more intuitive navigation and it helps users see at a glance the number of available jobs through a simple mouse hover over a specific area. 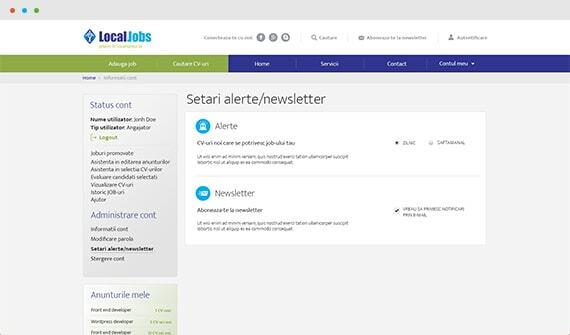 Custom alert systems are the bread and butter of any responsible job search platform. Companies want to be automatically notified when someone applied to their jobs or when a CV that matches their criteria was found. Individuals want to be automatically notified when a job that fits their search profile was introduced or when an employer viewed their application. Implementing such a customizable system alert that would serve both the end-users and the companies was one of the certainties of the project from the very beginning. On top of all that, all users can subscribe to the company’s newsletter and automatically receive updates on relevant information that they post. 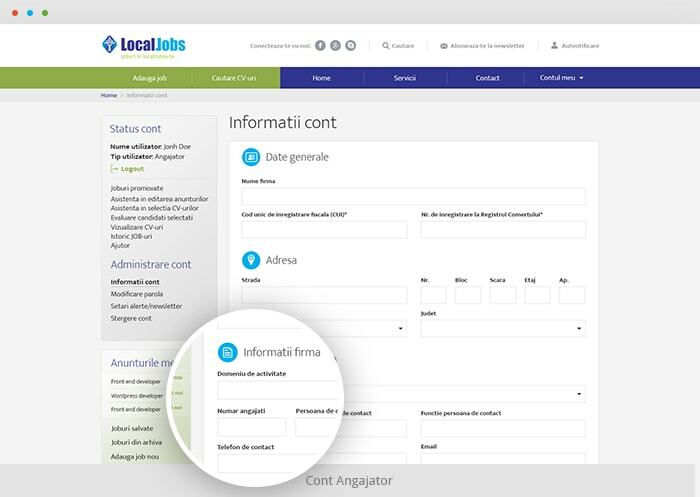 Local Jobs wasn’t meant to be one of those typical platforms where companies pay a flat fee for every job description that they introduce through a standard form or individuals fill in their CVs and aggressively start applying for jobs. The client offers all kinds of adjacent services, hence the need to implement a multi-package option for companies and end-users alike. Counseling for crafting a professional CV or for career orientation, counseling for crafting professional job ads, outsourcing of candidates’ psychological evaluation, different promotion packages for job ads – all these are just a few of the details the client wanted to implement and our team had to provide technical support along the way. One significant part of the development process aimed to provide a flawless experience to the end users. While the platform serves both employers and employees, the last category is likely to drive more traffic, hence the need to provide superior services. For people looking for a job, we implemented an easy-to-use CV management system that makes this task less of a drudge. At the same time, we haven’t neglected the needs of employers, who have to surf through all those CVs and identify the best candidates. 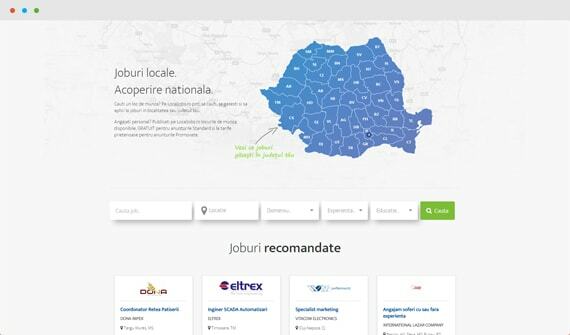 In the end, Local Jobs platform got to benefit from a modern, easy-going, and user-friendly environment where even the less tech savvy users can find their way and where any job description is brought closer to the user. We wanted to design a high-end product for our client and that’s what we did. 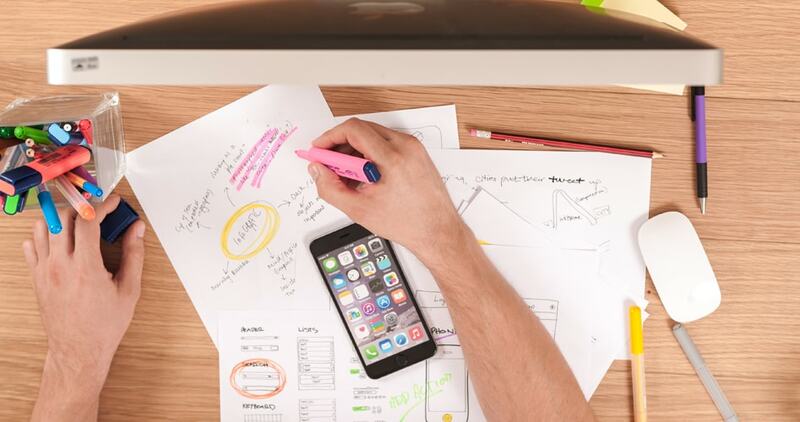 At the same time, there were quite a few demanding requirements coming from their side, which took some effort to implement seamlessly, in a user-friendly manner, that wouldn’t compromise the aesthetics of the website in any way. Looks like we’ve successfully reached our goals, once again. 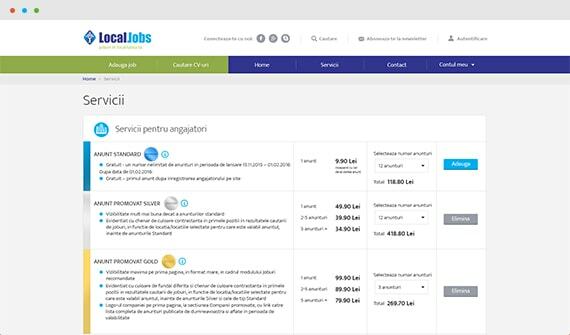 Did you like the modern online job platform - Local Jobs?